Every year, on the 4th February, a service is held in St. Gallgo’s to commemorate the man who was rector of the Parish at the time of the “Royal Charter” shipwreck disaster in 1859 Revd. Steven Roose Hughes. Exhausted from the huge amount of work the rector carried out, he died a young man on the 4th February 1862. 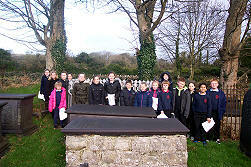 The services are led by pupils from Ysgol Gynuned MOELFRE Community School. 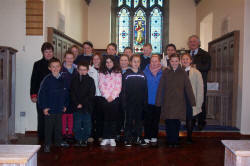 The children choose and lead the hymns which are interspersed with presentations by the school in Welsh and English on the subjects of: The "Royal Charter", Rev. Stephen Roose Hughes and Charles Dickens and the "Shipwreck" story in his book 'The Uncommercial Traveller'.